Product prices and availability are accurate as of 2019-04-20 10:03:41 EDT and are subject to change. Any price and availability information displayed on http://www.amazon.com/ at the time of purchase will apply to the purchase of this product. Cool Calming Mist: Fill the air with soft swirls of cool, fragrant mist, creating a soothing environment in your living room or workspace. Ultrasonic technology doesn't damage the natural power of the essential oils. Mood-Enhancing Lights: Choose from an array of 7 calming colors. The energizing yellow of natural sunlight, lifegiving green of forests & hills, balancing blue of skies & seas, and many more. Silent Operation: Soundless ultrasonic operation makes this diffuser the ideal choice for work, meditation, yoga and overnight use. Timer and Auto Shut-Off: Set to run for 60, 120, 180 minutes or until empty. When water is used up, the diffuser automatically shuts off to ensure safety, energy efficiency and peace of mind. 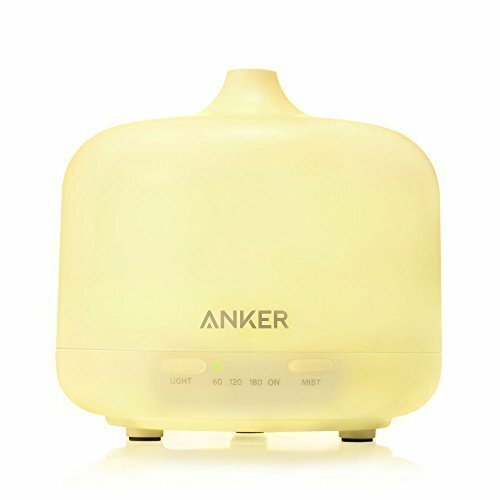 What You Get: Anker 250ml Oil Diffuser, detachable power cable, filling jug, welcome guide, our worry-free 18-month warranty and friendly customer service.